During the past days, I have been impressed by the teaching methods that Jean-Noël and Olivier Heinry use in the ‘Valise Pédagogique Création Interactive’ workshop. The workshop lessons about interactive tools and programming are divided into three parts: 1. Data capturing, 2. Data filtering and 3. Action – what are the effects that system can generate. This is an autonomous, interactive system, and also a basis for a methodology for creating interactive art. The purpose is to offer a simple approach that anyone can learn. But this workshop actually aims for much more than just teaching these theoretical and practical lessons. The approach is holistic – the workshop teaches ‘how to be an artist who uses interactive technologies’. This means, for example, that the participants are educated about the financial aspects related to interactive technologies, so while they are learning about the tools they should also think about what kind of economical logic (not only in the sense on money, but use of time, and other resources) could work for them in future. The students learn the basics of Cybernetics through various simple examples. In his teaching, Olivier is using the methods he has learned in working as a member of various dance projects (especially via working with Good Work Productions), and also partly from his knowledge about collective software development. 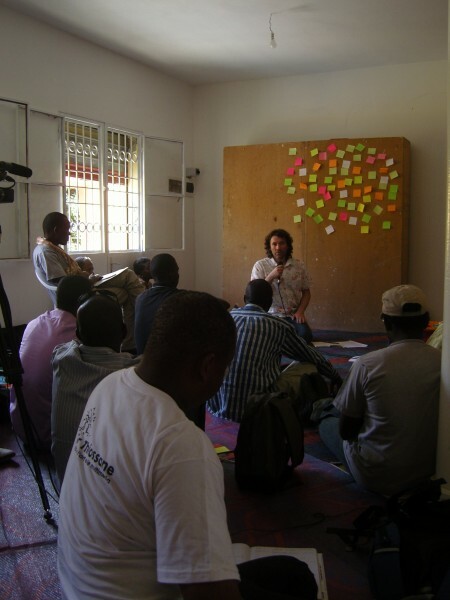 Olivier studied fine arts and learned his computer / software skills himself, and he was particularly impressed by a method called Scrum. This method is an iterative process, which assigns roles to people (instead of building a top-down hierarchy) and allows the teacher not to be the ‘boss’ but rather a facilitator of activities. For Olivier, it’s important to aim for the autonomy of the participants. The participants themselves occasionally become teachers themselves – once they have mastered a skill they can assist others, or they can give a presentation about related projects that they have been previously been working on.